This is a 32-page Facilitator's Guide for Level 3 of the 4-H Weather and Climate Science curriculum. This curriculum is for youth who enjoy learning about science, especially weather and climate. 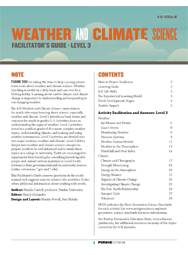 Level 3 activities are divided into two major sections: weather and climate. Level 3 delves deeper into weather and climate science concepts to prepare youth to be well informed and to study these topics at a college or university.